Yes, well, regrets? I have a few. As rallying cries go, that’s one of the lamest in recent memory. 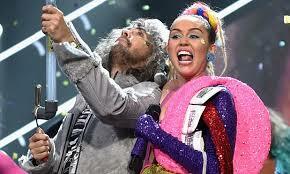 A silly number of critics are hailing how “daring” Miley was to self-fund (for a reported $50,000) her fifth album and to self-release it outside her contract with RCA, all in homage to a succession of beloved but now-deceased critters (her dog Floyd, her blowfish Pablow, and her pal’s cat Twinkle). The smart and ambitious pop star grasping for credibility via a sharp left turn toward the underground is nothing new, either, so it’s easy to see why she’d gravitate toward her primary collaborator here, Wayne Coyne of the Flaming Lips. But what’s in it for him? As for the offspring of the two’s coupling (midwifed by a number of others, including Ariel Pink, Big Sean, and Mike Will Made-It; the full credits can be found here), the 22 tracks aren’t “the grossest”—there are hints here and there of the robust and undeniable instrument displayed on, say, Miley’s cover of “Jolene,” and she is undeniably a sometimes entertaining hell-raiser, if nowhere near the paradigm of female self-empowerment cited by some boosters. (She still plays the male fantasy card all the time.) But the majority of the tracks sound like either hastily rewritten and vastly inferior Lips tunes circa The Soft Bulletin or Yoshimi Battles the Pink Robots, minus the rhythmic drive and anthemic hooks, or unfocused, rambling synth noodles of the sort the sort that Steven Drozd and Wayne’s kin Dennis Coyne might churn out while waiting for the New Snake Person Guru to finish one of his monologues/harangues. That is to say, the tragic low of the band’s last proper album The Terror continues, and it gets harder all the time to recall why this group once really mattered as a paradigm of true fweakiness paired with undeniable rock power and unbeatable pop smarts.